It's a long summer: Here we see Paul Assenmacher nearing completion of one of the greatest pointless baseball pranks of all time. For six months, the pitcher grew and piled his 'do into one of the finest hair helmets seen since the Colonial days. And when Assenmacher was called in to close a game that Sept. 17, his efforts had finally paid off. Instead of wearing his ballcap, the southpaw had painted his coif blue with a red "C" on the front. But the fake hat was so perfectly rendered that nobody even noticed it wasn't regulation, thereby ruining the joke. A heartbroken Assenmacher shaved his head the next day. 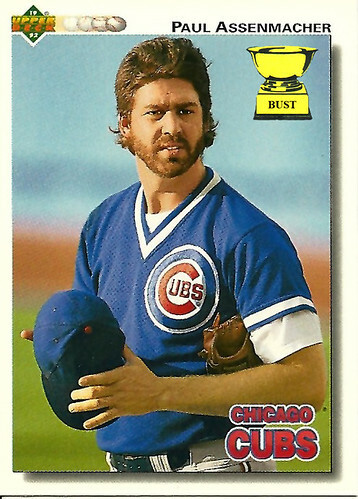 Rick Sutcliffe laughed.